The morning commute can look the same everywhere. Cars winding through the same roads at the same time. For commuters heading through Upper Front Street in Binghamton, consistency is something they can count on. They know that when they reach the bridge right before the Dunkin' Donuts, she'll be there. "She" or "The Waving Lady" is a petite, elderly woman waving her hand vigorously at passing cars. She waves at cars, tractor trailers, police... School buses are her favorite. Every time one stops at the light, she walks the length of it, waving to each child. They all wave back. That's been the routine for a few years now. If you pull over, you'd find out her name is Pat Crossman and she's not really sure why she started this. "I just started waving and it took off," says Crossman. 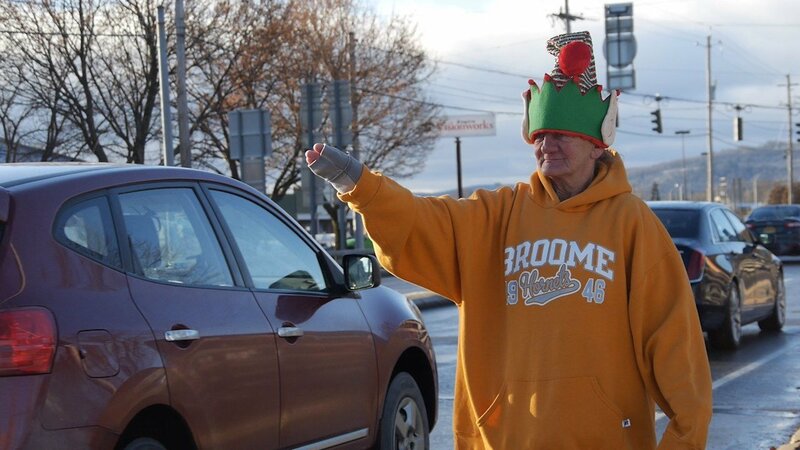 Pat Crossman waves at cars on Upper Front Street. That was a few years ago and she's been on the job nearly every morning since. At one point she would walk all the way from Coventryville where she lived. Without a driver's license, that was a two hour walk each way. Now, she lives in a camper on Front Street. It's a much shorter commute for the job that pays nothing, but, at the same time, everything. When asked how it feels when people wave back to her, Crossman says: "Great. Because I don't have any family. I've never been married, never had kids. I don't have nobody." She was born in Cortland and spent her childhood in the foster care system. With no family of her own, she just wants to be around people. "They wave back and are nice to me... That makes my day," says Crossman. That goes both ways. People in cars going by smile and wave, while some roll down their windows and shout "good morning!" "It's almost like driving by a monument and you like seeing it that day, but if it was alive and there for you... she's like a town staple, it's really nice," says Andrew Simek, a barista at Dunkin' Donuts. Simek says he sees Pat every day. His co-workers and regular customers know her and have in a way become part of the family she's built herself on Front Street. "She comes in here to warm up and get coffee and stuff like that," says Simek, "We all know her order." Blueberry coffee with extra cream, no sugar. "When they see her meander over here, they know it's coffee time. More waving energy," says Simek. The Dunkin' staff and regulars are happy to give it to her, because we all know one gesture can mean everything. Pat acknowledges she's had some times, but, not one to get down on herself, she says: "I don't have much, but I've got a wave."